To set priorities after a discussion or a brainstorm. Divide the participants into small groups of 4-8 people. Give each group a piece of flip chart paper and some post-it notes/sticky notes. 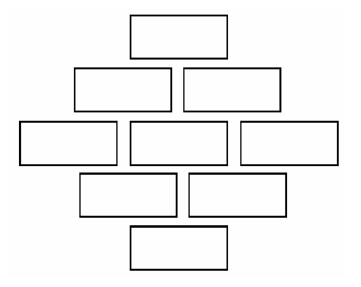 Ask each group to draw a boxed, diamond shaped figure on their flip chart paper so it looks similar to the figure below. Ask each group to choose the nine most important issues that were discussed and prioritise them according to importance. They can post the post-its/sticky notes on the squares provided, with the most important one on top, then the next two in importance until they’ve ranked all nine. Youth Programming Toolkit, ActionAid International, 2013, p. 47.